The Easter Bunny, the Fair & the Penguin. Today is Easter, which means this morning the Easter Bunny came and although I wasn’t able to eat the chocolate that he left, I was still just as excited as what you would expect a five year old to be. Like every year, my beautiful little Easter Bunny had been and gone by the time I woke up and like always she had left my chocolate out on the kitchen bench for me to find. This year though, instead of eggs, she had left the cutest little Easter chicks that I had ever seen. They were called Samantha Chicks and they were absolutely adorable. So adorable in fact that I was almost pleased I couldn’t eat them, because their little faces were just far too cute to chomp on. After finding my easter presents and falling completely in love with my Samantha Chicks, I decided that it was time to return the favour. Boyfriend had stayed over that night and was still fast asleep, so I did what any loving girlfriend would do and I left him an easter egg trail. Creme Eggs are his favourite and given that they often only come out at Easter time, I of course bought him a whole entire carton. There were forty-eight eggs in total, about thirty of which I spread out along the ground, starting from my bedroom door and going all the way into the playroom where he would find the rest of his eggs, it was an Easter masterpiece. Although he obviously had a feeling it wasn’t actually the Easter Bunny that left the trail and going by the smile on my face, I would say that I probably gave it away within the first five seconds, he was still extremely impressed. So impressed in fact, that not only did I get a million and one hugs and kisses, but later that night he took me to the North Lakes Fair just so that he could win me an Easter teddy. Mumma came with us of course and we met up with my very beautiful and very pregnant bestfriend and her Fiance. Now, those of you who already know me, would know that I like Carnivals even more than I like chocolate, and that is saying a lot. So although it was Easter, a night at the Fair was still ten times more exciting than any easter egg hunt could have been. Mind you, this particular Fair wasn’t exactly designed with people of our age in mind. Considering it was a little bit on the smaller side, I would have guessed that the target audience was more than likely ages ten and under. I didn’t overly mind though, at the end of the day it was still Easter, I was out at a Carnival with three of my favourites and I could rub my beautiful bestfriend’s baby belly as much as I wanted; what more could a girl want? Just in case that wasn’t enough though, just to top it all off and make it an absolutely perfect night, my stud of a boyfriend ended up winning me my Easter teddy after all. He may not have been a teddy as such, but he was big and he was beautiful and I loved him from the very second he fell into my arms. 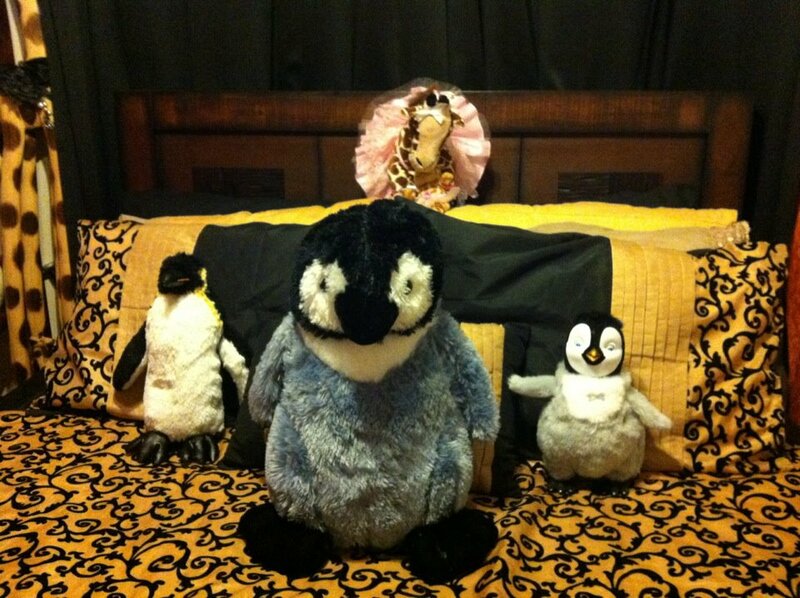 Dear World, I’d like you to meet Flip; the newest and fattest member of my beautiful penguin family.